Adenocarcinoma of the pancreas is the fourth leading cause of cancer death in the United States and is increasing in incidence. Intravenous ascorbate (i.e. high dose vitamin C), but not oral ascorbate, produces high plasma concentrations, which are in the range that are cytotoxic to tumor cells. Previous studies from our lab have demonstrated that ascorbate, in doses achievable in humans, synergizes with chemotherapy or ionizing radiation to decrease viability and proliferation in all pancreatic cancer cell lines examined, via an H2O2–mediated mechanism. In vivo, pharmacological ascorbate combined with irradiation or chemotherapy resulted in decreased tumor growth and increase survival in our pancreatic xenograft model. Our completed phase I studies display similar results, and establish that pharmacological ascorbate combined with gemcitabine or irradiation is safe, well-tolerated and may lead to an overall clinical benefit in patients with stage IV pancreatic cancer. Currently, the lab focuses on multiple avenues for the utilization of pharmacological ascorbate in the treatment of pancreatic adenocarcinoma. One area of interest is the susceptibility of cancer cells, relative to normal cells, to ascorbate-induced cytotoxicity due to increased ascorbate auto-oxidation leading to increased H2O2 production. Increasing the rate of auto-oxidation of ascorbate with redox active metal catalysts to generate more H2O2 should selectively increase ascorbate-induced radiosensitization and oxidative stress. Ascorbate-induced radiosensitization would be expected to sensitize tumor cells to clinically relevant pharmacological agents that inhibit the removal of H2O2. Another avenue of investigation by the lab is the potential of pharmacological ascorbate as a radio-protectant to normal cells/tissue. Initial results both in vitro and in vivo indicate that pharmacological ascorbate may reduce or reverse radiation induced intestinal damage to normal tissue. The clinical effect of radiation damage on the small intestine is demonstrated by villous blunting, loss of crypt cells, and collagen deposition. Mitochondria appear to be sensitive to radiation effects which are characterized by swelling, vacuolization, loss of cristae structure, and membrane rupture. In vivo studies by our lab demonstrate that pharmacological ascorbate partially reverses IR-induced jejunal damage suggesting that ascorbate may protect the gastrointestinal tract from damage generated through irradiation. The lab also examines the application of pharmacological ascorbate in the treatment of metastasis in pancreatic adenocarcinoma. Migration and invasion are decreased in vitro after incubation of pancreatic adenocarcinoma cells with pharmacological ascorbate. Exciting new results by the lab outline a method for isolation of circulating tumor cells following ultrasound guided orthotopic injections of pancreatic adenocarcinoma in vivo. Initial results indicate that tumor burden and circulating tumor cells are decreased following treatment with pharmacological ascorbate. 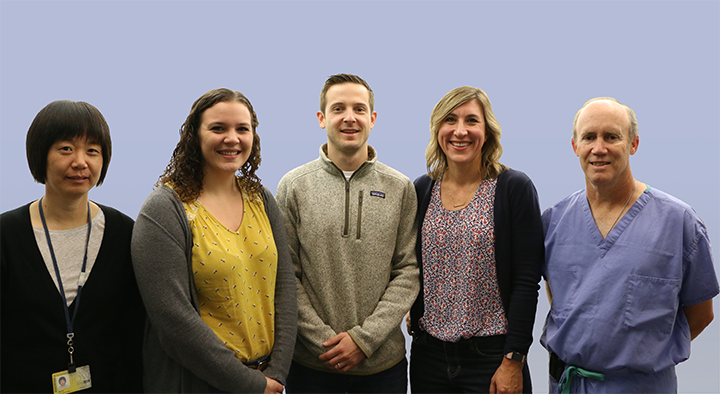 The Cullen lab hopes continue these studies in order to provide a foundation for the rational design of a novel combined modality cancer therapy for pancreatic adenocarcinoma.